The National Socialist Council of Nagaland (Isak Muivah) (NSCN(IM)) appears to have broken from its pattern of non-interference in the electoral process since the Framework Agreement was signed in August 2015. On, March 29, Jaley Anna, a party worker for the National Peoples’ Party (NPP) died in Tirap district in Arunachal Pradesh after being beaten by members of the NSCN(IM). The next day, Seliam Wangsa, a surrendered militant and former zilla parishad member was killed by the members of the NSCN(IM). Meanwhile, reports indicate that the Zeliangrong United Front (ZUF) has taken umbrage with the NSCN(IM) for intimidating voters in the Zeliangrong inhabited areas of Manipur. Through a press release on April 2, the ZUF has alleged that the NSCN(IM) and its front organisation, the United Naga Council (UNC) have been intimidating voters and candidates to favour a particular tribal party. The release did not mention which party the ZUF was referring to. The various NSCN factions have had a history of favouring particular candidates and parties in various constituencies with Naga populations. In 1999, Mukut Mithi was accused of making a deal with the Khaplang faction of the NSCN to engineer unrest and a coup that led to ousting then Chief Minister of Arunachal Pradesh, Gegong Apang. In Manipur, on the other hand, the NSCN(IM) has in the past enforced its diktat in the Naga areas to vote for particular candidates. However, the present killings in Arunachal Pradesh may be a one-off incident where punishment is being meted out to deserters. The killing of Seliam Wangsa may be perceived to have been one of ‘dealing with a deserter’. 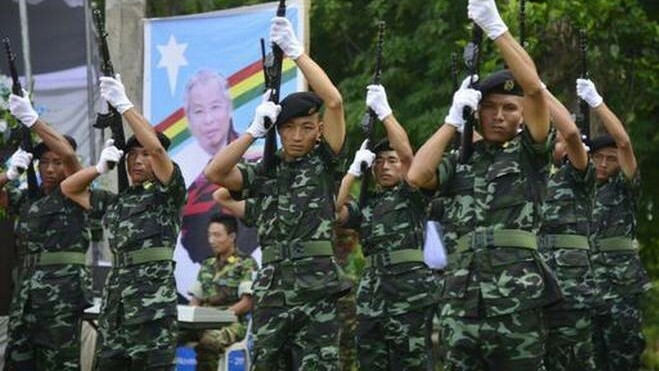 Wangsa had joined the NSCN(IM) in 2006, however, he surrendered in 2014 and ceased his activities with the organisation. Generally speaking, all armies – whether of a country or otherwise – tend to prescribe exemplary punishments for desertion. Hence, Selaim Wangsa’s surrender was probably perceived as a desertion. According to reports, Seliam Wangsa had survived a gun attack in the past. Jaley Anna, on the other hand, then appears to be an anomaly. There are no reports that indicate whether he had any prior dealings with any of the NSCN factions. However, the Arunachal Times also reported that a Congress candidate was forced to withdraw from the race allegedly at the behest of the NSCN(IM). Apart from some youth getting recruited to various NSCN factions in the easternmost three districts of Arunachal Pradesh, the area has been a battleground of sorts for decades. On one hand, the Permanent Resident Certificate (PRC) fiasco in Arunachal Pradesh was borne out of the mixed demographics of the region. Along the Assam border there is significant overlap of populations. Whereas in the Da-Wo-Di Valley, now known as Vijaynagar, the retired servicemen from the Assam Rifles, most of whom are Gorkha were forcibly settled there. The idea was to establish an easternmost post until the Indo-Myanmar border in that area could be demarcated. At around the same time, the Chakma refugees fleeing ethnic persecution in East Pakistan were settled in the area as well. With the establishment of the NSCN in the 1980s, the organisation embarked on a nation building exercise bringing the animist Nagas into the Baptist fold. Bertil Lintner, in his book Great Game East, mentioned that the last head recorded to have been ritually hunted was in 1986 in Myanmar. This was also the time for fratricidal killings amidst excessive militarisation in the Naga inhabited areas of Nagaland and Manipur. The eastern districts of what would later become Arunachal Pradesh however, provided respite to the NSCN cadres as well as a transit route through hills and dense jungle to Myanmar. Till now, the topography of the eastern districts of Arunachal Pradesh remains a major thoroughfare for the armed political groups in conflict with the Indian State. Therefore, the battles waged here are on two fronts. Firstly, there is the battle of supremacy and control between warring armed political groups; secondly, between the armed groups and the Indian security forces. In the midst of this, the local populace attempts to go about their daily lives as best as they can. In Manipur however, the matter gets more complicated. The NSCN(IM) has a greater reason to exert control over the majority Naga inhabited areas primarily since their general secretary, Thuingaleng Muivah is from Somdai in Ukhrul, Manipur. The ethnic cleansing borne out of the Naga-Kuki conflict has also aided in establishing ethnic boundaries in the Hill districts. Such ethnic territories tended more to pertain to individual villages or village clusters rather than large swathes of land. Hence, from the perspective of the NSCN(IM)’s territorial integrity of Naga areas, the stakes in Manipur tend to be higher. This is more pronounced as the communities living in Arunachal Pradesh, who the Naga nationalists have brought under the Naga umbrella appear to be largely ambivalent to the Naga nationalist cause. The NSCN(IM) remained fairly mute since signing the Framework Agreement in 2015. The issue of a solution before election became a hot topic ahead of the Nagaland Assembly polls between 2017 and 2018. Yet, the NSCN(IM) never issued any statements either in favour of a poll boycott or against it. Further, there were no reports of the NSCN(IM) getting involved in local political tussles in the state. The NSCN(IM) did not issue any statements on the Citizenship Amendment Bill, unlike the reactions from other armed groups such as the United Liberation Front of Asom (Independent). Therefore, what makes things different this time? Considering the dithering on the Framework Agreement with both sides blaming each other for the protracted negotiations, it would appear that there is a sense of unease if a change in government occurs after the Lok Sabha polls. It ought to be mentioned that Anthony Shimray, a permanent member from the NSCN(IM) in the Indo-Naga peace talks was abducted from Kathmandu in 2010 during the term of the Congress-led United Progressive Alliance. His release from Tihar Jail was allowed by the Bharatiya Janata Party as a ‘goodwill gesture’ in 2016. Perhaps, the NSCN(IM) signing the Framework Agreement in 2015 may have influenced this goodwill. However, the Framework Agreement has not been made public till date. At the same time, the political climate in India has probably not been lost on the aging leadership in the NSCN(IM). It is possible that the moves in Arunachal Pradesh and Manipur are to influence ‘facts on the ground’ since the Final Agreement is yet to be inked.